Alexander Alekhine arrived in Montreal on November 17th, 1923 after a trans-Atlantic crossing aboard the steamship Minnedosa, after having set sail from Cherbourgh. Alekhine began his North American tour, giving an exhibition at Montreal's National Atheltics Association on November 22nd, against 37 local players, winning 27 games, with five games ending in a draw and losing five. He would give a number of exhibitions in Canada before crossing the border to the United States. Alekhine's first exhibition in the U.S. was on December 12th at the Manhatten Chess Club, where he played 33 games including two blindfolded, winning 22, with 9 drawn games and 2 lost games. He would give many more displays of his chess abilities before reaching Chicago. Alekhine, after giving a simultaneous exhibition in Cleveland on January 25th, with stops along the way in Detroit (January 28th) and South Bend (February 1st), to give exhibitions, now made his way to Chicago. 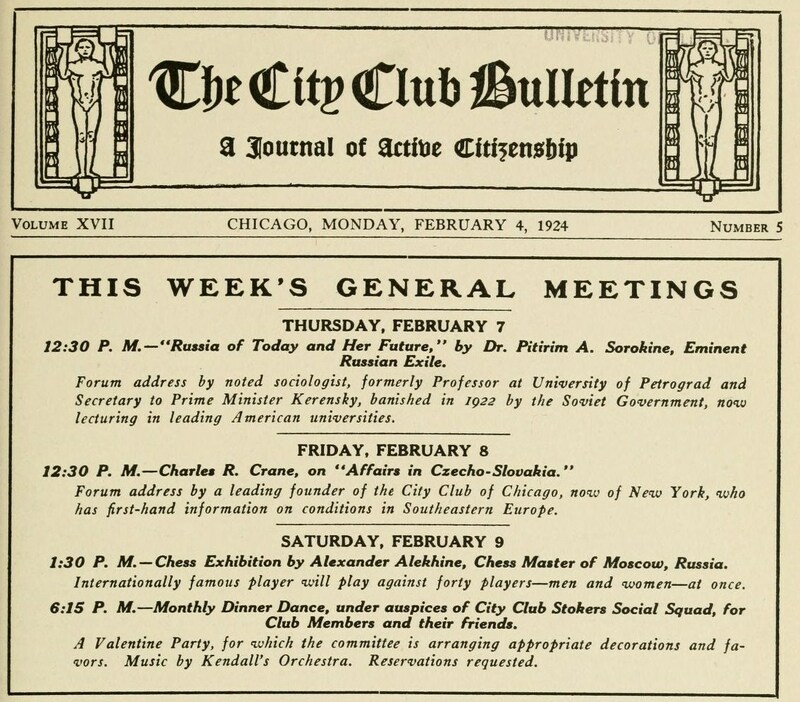 The City Club Bulletin of Chicago for Monday, January 21, 1924 , had already announced that a exhibition by the Russian chess expert Alekhine was to take place at the club. without sight of the boards or men. This performance promises to be the most interesting ever put on by the chess section of the City Club and all members interested in chess are invited to be present with their friends. Those wishing to try their skill against Alekhine are urged to make reservations at once as the number is limited to forty." But before the exhibition at the City Club, Alekhine would give a simultaneous display on February 5th at the Hamilton Club. In the February 4th, bulletin a special invitation was extended to women chess-players to take part in the exhibition with the Alekhine, noting that several female players had already agreed to participate. The Lincoln room on the fourth floor of the City Club had been set aside for the exhibition. in the Lounge of the City Club on Saturday afternoon, February 9, and after five hours of play lost two games, drew two and won thirty-six Lewis J. Isaacs of the Chicago Chess Club and Francis P. Byerly of the City Club scored wins; Miss Harriet Ray, daughter of William D. Ray a member of the City Club, and H. C. Levinson secured draws." During the exhibition Alekhine played two blindfolded games, against Mr. S. R. Watkins and Miss Florence Gleason winning both, the unique feature of the game against Miss Gleason is that she also played without sight of the board against the Russian master. In the end she lost but not before a "stout resistance". "Miss Gleason also played her game without sight of board or men, and was only defeated after making an oversight at the last. She is the only woman chessplayer, as far as is known, who is able to play in this manner, and her game was the center of much attention by the gallery." Alekhine was quoted '...in a report published in The Brooklyn Daily Eagle, 21 February 1924, A3. "In my opinon there was not another women in the world who could do what Miss Gleason had accomplished" '. 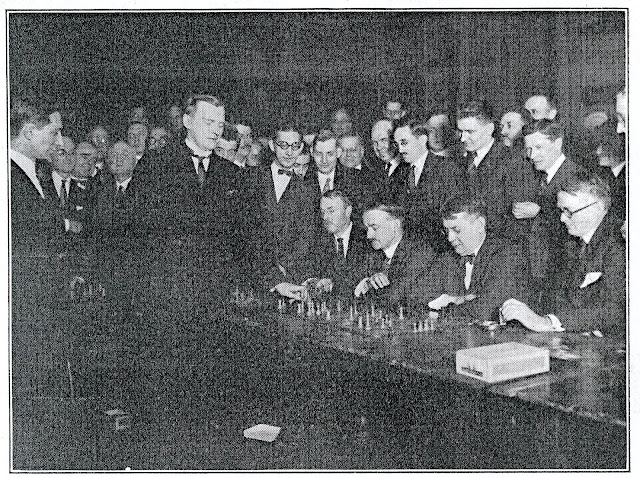 The next stop on the future world champion's tour was Milwaukee, where he was to give a simultaneous display at that city's City Club on February 11th, he was joined on his journey north by the western champion Edward Lasker, who would act as referee and give a chess lecture prior to the display. 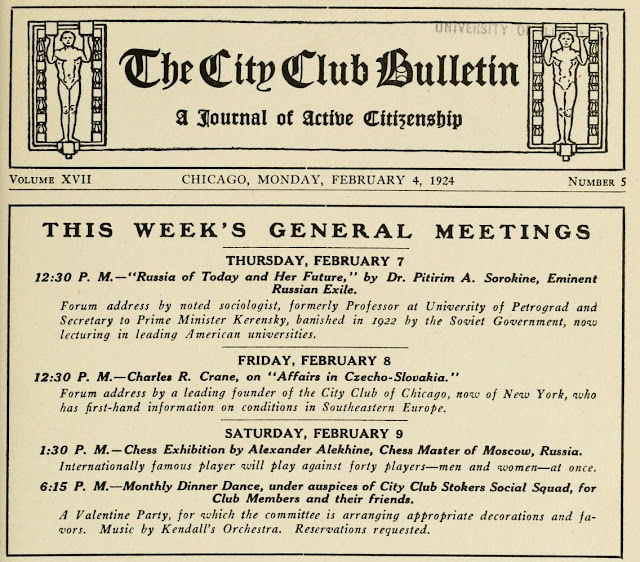 Alekhine would return to Chicago in 1929 again giving an exhibition at the City Club, again in 1932, and 1933 during his world tour, but those are stories for another post.